Caesar's Palace is a name that you may have heard often since it is a casino that hosts many of the televised poker events in the industry. It's also a name associated very intimately with the idea of luxurious Las Vegas . For this reason it might be out of reach of some of the people that want to vacation there, but if you can afford the going rate that starts at $120 a night you will be treated to an experience of luxury and ease that you won't soon forget. In many ways, this excellence is what epitomizes the greatness of a Las Vegas vacation. Like all of the other great hotels and casinos that you would expect to see listed in Las Vegas , Caesar's Palace is located on South Las Vegas Boulevard . This is the main tourism hub of the city and it is also more commonly known as the Las Vegas strip. The hotel inhabits this part of Las Vegas with many of the other great resorts of the city and this means that all of the different entertainment venues for production shows, nightlife and general relaxation are all going to be in walking distance of your room at Caesar's Palace. For that reason, the hotel is located in one of the most prime positions in the entire city. 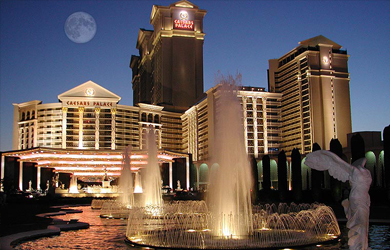 The accommodations at Caesar's Palace are some of the most luxurious around. While many people might be turned off by the fact that prices at this particular establishment begin at approximately twice the cost of many of the other hotels located on the strip, you need to be aware of the fact that you are definitely going to get what you pay for. The extra money per night that you shell out to stay at Caesar's Palace will be brought back to you in the form of better rooms, better amenities and better service. The room service detail at this particular hotel has long been thought of as being the best in Las Vegas and that is really where the extra cost of the room comes from mostly. For some people this will be worth it and for others it will not. There are many extras that come with a stay at Caesar's Palace, not the least of which is the chance to play at one of the better casinos around. In fact, you can pay for part of your hotel stay by playing at the casino. There are also many excellent shows available in the same building for you to visit including Jerry Seinfeld, Cher , Elton John and just recently Bette Midler as well. All of these extras would still be available to you if you didn't stay at Caesar's Palace, but getting to them and getting tickets for them is a lot easier to accomplish if you're also a guest at the hotel. After looking at all of the evidence, the only reasonable conclusion that can be reached is that Caesar's Palace is one of the best places to stay in the entire city of Las Vegas . It might be more expensive, but the expense is certainly worth it.